The cross stitch is alive...with the sound of music!!!! You don't need to have rhythm to stitch up these fun music inspired patterns. They are perfect for the music lover in your life and they will be happy that you stitched them up a song instead of singing one. From singing out loud to playing an instrument, the patterns below have a little something from everyone. They range from fun and whimsical to traditional. Below is a small sampling of the best music related cross stitch patterns from the internet. Doe a deer, a female deer.....you know the rest, I will spare you my singing, but I do want to share with you this great sampler of the beloved song from the Sound of Music. Wouldn't this pattern be perfect for the drama lover (the theater kind, not the drama llama kind) or music teacher in your life? It would look great in a music classroom or office. What about a theater's waiting room? Silver Creek Samplers has created this pattern, along with the remainder of the song to complete the sampler. Growing up in the 80's radios aka boomboxes were huge! You had to have serious guns to carry your radio around. You would take you radio to the beach and everyone had to listen to what you were playing. If you were lucky, the cutie on the towel a few feet down would come over and you two could cut a rug. Nowadays, you are isolated with earbuds and wear too much sunscreen. 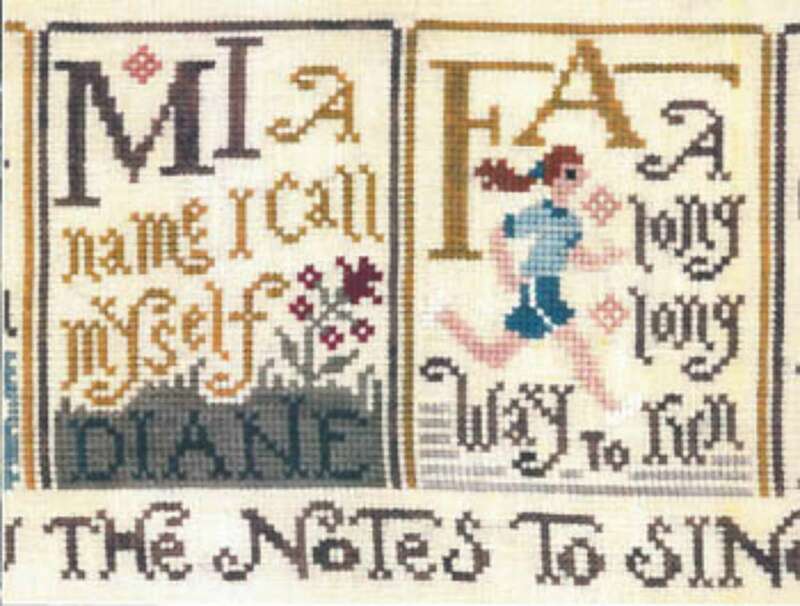 You can relive your glory days with this awesome pattern from Daily Cross Stitch. It is a must that you put on Van Halen's 1984 while stitching this. Tease your hair into a mall claw and have some fun! This pattern is perfect for those in your family or circle of fans that have their feet firmly planted in the 80's. It is also perfect for those of us who love the movie Say Anything. Make sure you stitch this up and raise it above your head. Stitch this pattern up for your favorite DJ. Stitch it onto a bag for their record collection. Do you have a rock god in your house? I mean, really, who doesn't? Why not stitch them up this super cute Rock Music Alphabet Sampler by The Cloud Factory. This would be so awesome in a kid's or baby room. How funny would that be? Okay, okay...maybe in a music studio? Wherever you choose to hang your finished project, I'm sure it will RAWK! How great would this be in a real record store. Yes, they still have those. You could even stitch it up for your practice space or basement, wherever you want to rock out. Regardless of what type of music you love, there is a pattern for you. I love this sampler by Candamar Designs. It touches on all types of music and reminds us that regardless of the type, music brings us together. This pattern is a bit more subdue and traditional than the other patterns above but that doesn't mean it is any less. It covers so many varieties of music that it fits any style. From Jazz to Country, there is stitch and song for everyone. This pattern would look great on a bag for your instrument or on a t-shirt or jacket. Show your musical pride. Although there are different types of music, it is the one thing that brings people together. It offers comfort to us when we are sad, brings us tears of joy and allows us to bond over a melody. PixlStitch has created a bright modern design featuring a young girl listening to music. The shapes and colors are different, just like music, but everyone can appreciate the song being heard. This would be a wonderful project to cross stitch for the friend who is hip, modern and upbeat. 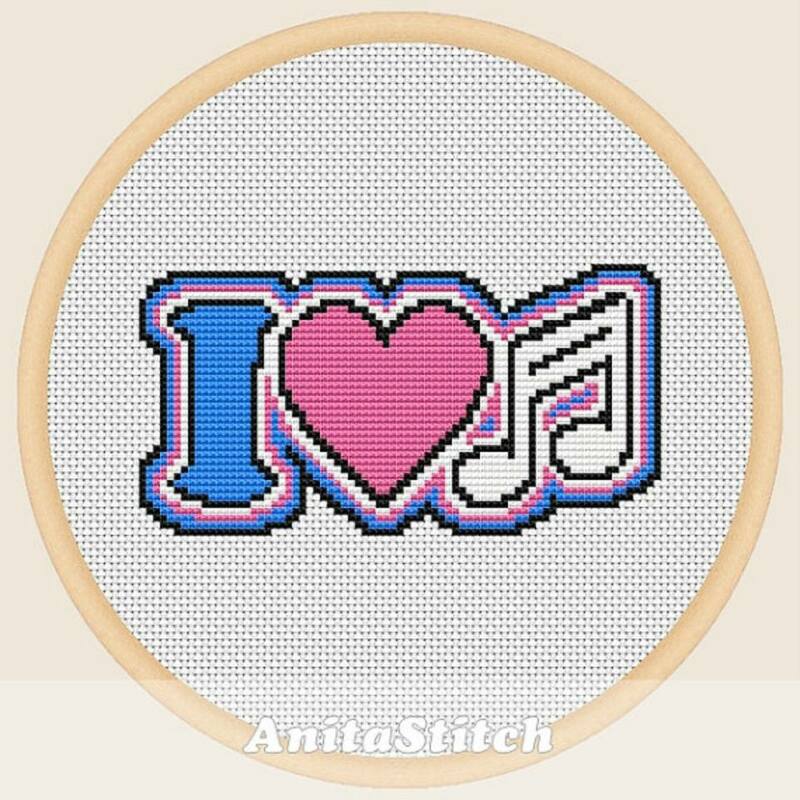 Release your inner 80's child with this fun I Love Music pattern from Anita Stitch. This is a simple pattern that is perfect for beginners. It would be fun to use plastic canvas and make this pattern into a pin to wear. You could also stitch it on a totebag or jacket using waste canvas. Customize the pattern even more by changing the colors to fight your style. Make up several for all of your favorite band members at school to show that you support music and the arts. It doesn't matter if you can carry a tune, you can stitch. Throw on your favorite song and stitch the way you feel. It doesn't even have to make sense to anyone but you. Let the music guide your needle. You can write a song with your floss and fabric. From classical/traditional to contemporary/whimsical, the music patterns above fit every style and music listening preferences. Stitch the notes and let your heart sing!